There is a huge choice of alcohol-free drinks available in cartons, bottles and cans these days. If you fancy making your own drinks with a difference have some fun with these traditional refreshments. Unlike a lot of alcoholic homemade wines and beers, these drinks don’t need to be left for ages before they’re ready to enjoy either! For children, adults who don’t drink alcohol, or anyone who just fancies making an alternative type of liquid refreshment during the festivities, we explore some homemade options. This is a really refreshing drink that can be mixed and matched with other fruits, soda water, or lemonade. Whizz together in a blender the lemon juice, sugar and a quarter of the water. Add the rest of the water along with the kewra essence and whizz for another 10 seconds. Put four tablespoons of the sherbet into ice cube containers, or, if you have four plastic beakers that can be frozen, use those. Placing the four containers in the freezer-overnight is fine. Remove from the freezer half an hour before serving and put the sherbets in the fridge. Stir well and decant into four glasses-add crushed ice and slices of lemon.Blackberries can be used instead of lemon. If you prefer to serve this fizzy, omit the water to make a more concentrated sherbet. Freeze as before, then, simply add chilled soda water or lemonade when ready to serve. This soft drink has a more bitter-sweet flavour than the previous recipe. Place the chopped salad leaves in a jug. Add the grated rind and sliced flesh of one lemon (remove the pith.) Pour on the boiling water and add the honey so that it dissolves. Leave to cool. Strain through a sieve or muslin and serve the drink at room temperature, or chilled, with crushed ice. The following ingredients make 1.75 litres approximately. In a small saucepan, mix together the sugar and water. Bring to the boil and simmer for about 5 minutes-but don’t let it boil dry!Leave to cool. 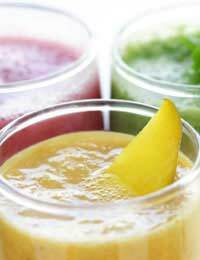 Add the combined fruit juices and refrigerate in a suitable container. When you are ready to serve this sparkling stink puff (pink stuff) add the ginger ale and Grenadine syrup. Stir gently and serve from glass jugs. To add to the sense of occasion, serve this drink in champagne flutes. This is a great one for the kids! It’s a special occasion milkshake that they will enjoy making with you. Whizz together in a blender the cherries in syrup, milk and 4 tablespoonfuls of vanilla ice cream. It only takes about 30 seconds to get the desired result. Pour the milk drink into four chilled glasses, top with a spoonful of vanilla ice cream and decorate with fresh cherries or hundreds and thousands. If you're looking for some more Christmas drink ideas (of the alcoholic variety), we have lots more in this section.